Your bike is probably your pride and joy; it takes you from home to work and back. More importantly, it’s there at the weekend and on your vacations to put a smile on your face. The fact that it helps to keep you fit is simply a bonus! As such an important part of your life it needs to be looked after; that’s why you need to consider which the best bike stand for your needs and budget is. It might even be necessary to buy two! The stationary bike stand simply allows you to park your bike and prevent it from falling over. This is not the same as the small, but generally fragile, stand that comes with your bike. A good quality bike stand will allow you to position your bike in your garage or other location and protect it from harm. Considering how much you’ve spent on your bike this is not a bad idea! Even if your bike is from the budget range you don’t want to risk it falling onto your vehicle or anything else of value. But a stationary bike stand does more than just look after your bike. If you choose the right one then your children can also use the bike stand. This will help to teach them to respect their bikes and the surrounding items; this is a great life lesson. It is a personal decision whether to also purchase a bike repair stand. These are generally larger pieces of equipment but they are invaluable when you need to complete any maintenance or even completely overhaul your bike. Of course, a bike repair stand will take up more space; you’ll need to consider the best one for your needs. There is a useful guide at the end of this article to help you choose the right bike stand. A bike repair stand can help you to save a significant amount of money. Taking your bike to the shop to have it fixed or maintained on a regular basis is likely to cause a strain on your wallet. But, more importantly, completing your own repairs and maintenance will allow you to know every detail of your bike and ensure it is maintained just the way you like it. It is little more frustrating than starting a ride only to find the brakes are in the wrong position or another critical component just doesn’t feel right. The great thing is that you don’t need to be a professional mechanic in order to have a bike stand and complete your own repairs. There are plenty of guides on the internet and, providing you take it slowly; you can learn everything you need to know as you go. It isn’t essential to have a bike workshop to complete your repairs in. There are several excellent bike repair stands that fold up when not in use. They are generally light enough to be easily moved and stored when not needed. You should also be aware that the right bike stand can act as a bike trainer stand. You can position this anywhere in your house or workshop and actually continue to use your bike; even if the weather outside doesn’t let you ride like you want to. In fact, a bike trainer stand is a great way to get a ride in before you start the long commute to work. 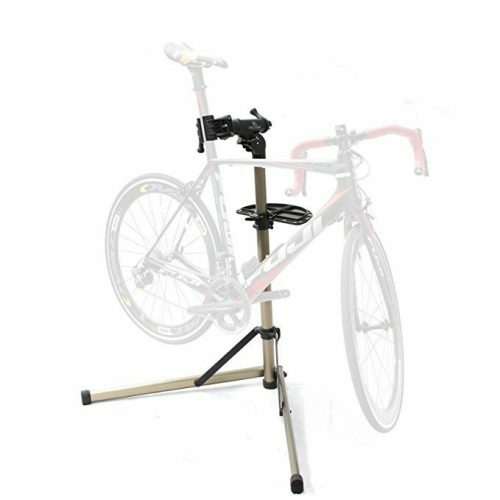 If this is going to be beneficial to you in your everyday life then you should consider selecting a trainer to stand as your main bike stand. In addition to helping you stay fit, you’ll know your bike is as safe as it can be! 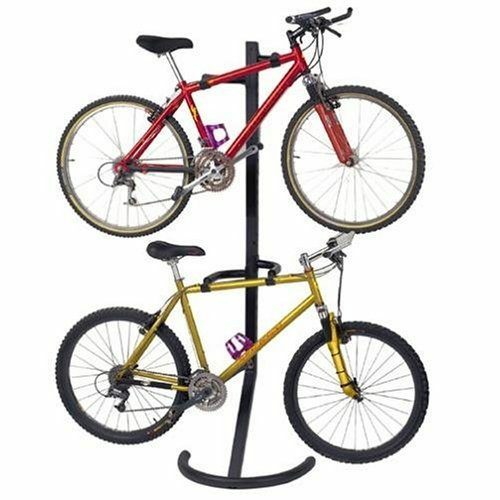 This is a freestanding bike stand for 2 bikes. It has arms which come out from a central bar to support each of the bikes. The bikes are stored vertically, one above the other. Each of the arms can be adjusted; they use a simple pin system. This makes it very easy to move the arms to the perfect position for your bike without needing to have any tools available. Once the arms are in position you simply need to lift your bike onto them. They are ‘U’ shaped; the top bar of your bike just drops into them. However, they are also very versatile. You can set the arms at different heights to accommodate sloping bars and even twist the clamps to accommodate the upright pole under your saddle, down the mainframe or a diagonal crossbar. The great thing about this design is that it is so flexible that virtually any bike can be accommodated on this bike stand. It is advisable to secure the more awkward shaped bike at the bottom of the rack; this will make it easy to put away and get out when you need t.
The structure is vinyl coated to ensure that your bike is well protected. It requires no screws or other fasteners; it really is free standing. That’s not to say this is the only option. There is a hole in the main pole that allows you to secure the bike stand to a wall. It even comes with a screw specifically for this purpose. Of course, this means you’ll need to drill a hole in your wall; about 3/8” should do. The Racor Pro PLB-2R measures 79 inches high, 26 inches long and has a depth of 19 inches. Of course, the bike or bikes will stick out past the frame; depending on the exact size of your bike. This rack can support 2 bikes up to a maximum weight of 100 pounds. But it only weighs 20 pounds itself! This means you can move it around your home or workshop if needed. The bike stand itself is made from heavy-duty steel and requires a minimal amount of assembly when it is delivered. Of course, no tools are necessary. It is black as the majority of these bike stands are. You will also be pleased to note that this bike stand comes with a lifetime warranty as well as an installment manual. 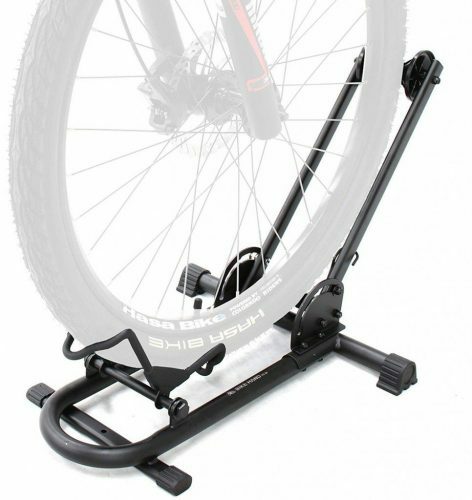 This is a great option if you’re not trying to get your bike off the floor or are looking for a solution that will allow you to take your bike stand with you. As the name suggests this is a floor rack which means that you don’t need to lift the bike up high. This could make it an attractive solution for older people who don’t want the hassle of lifting a bike onto its stand. The design of the Bikehand bike stand has actually been patented; because it is so simple yet effective. All you need to do is place the bike stand on a level floor. It requires no assembly when you buy it. Simply drive your front wheel into the stand. The front bar will tilt outwards as you do so; preventing you from going too far. The bike then sits in the groove made by the front arm and the rear arm; which has sprung up behind the wheel. This is a simple cup design, locking around your tire to ensure your bike stays upright. This means your bike is held by the front bar, rear clip and the lower groove created by these two bars! Potentially it is one of the most secure bike stands currently available. It is also possible to back your bike into the stand so that these pieces spring up around your rear wheel. Unless you push really hard on your bike it is virtually impossible to move or flip the bike stand. To take this stand with you it is possible to pull one knob and watch it fold. The process takes less than a second and allows you to carry the stand with minimal effort to wherever you are heading. 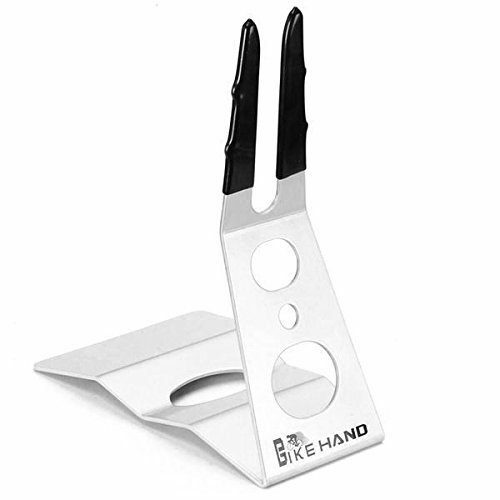 The Bikehand bike stand will accommodate most bikes regardless of the style of bike. The only restriction is that it cannot handle bikes with tires wider than 29” or mountain bikes over 700c and or tires over 2.4” in width. The manufacturer is so confident in their product that they are offering a lifetime warranty on all parts of the bike stand. Again, this warranty cannot be transferred between people. This rack can be used in your home as the base is rubber coated; allowing you to position it on any floor without damaging it. The rack itself weighs just 5.82 lbs; you shouldn’t have any problem moving it round with you! It is the perfect solution for your expensive bike; especially when you park it in a multiple of locations. This funky looking bike stand could be easily mistaken for a piece of fitness equipment! It can be used at your home although you will also find it in bike shops and even in garages! This is another rack that sits on the floor. The weight if it holds it in place when you slide your bike into the bottom groove. It is designed to handle the front or rear wheel and doesn’t come into contact with your frame. This helps to ensure your bike is well protected every time you park it up. To operate the bike stand you simply flip the upright bar upwards. This creates a groove for your tire and a stop to prevent the bike going too far. Then drive your wheel into the groove, the bike will stay in place because over a third of the tire is in the bike support; ensuring it can’t escape or fall over. The arm that sticks up is spring loaded; it can be folded back down very easily and the spring provides enough give to ensure you can’t push the bike in too hard and break the bike stand. At the top of the spring-loaded arm is a further double wheel. This grips the tire on your bike; helping to ensure it is safely in position and will not fall over. You can slot the front tire or the rear one into this stand and the result will be the same. The stand has a base of 16 inches deep by 13.5 inches wide. Folded the height is just 3.2 inches! It weighs a respectable 5.9 pounds and can accommodate any bike providing the tire is 2.4 inches or less. You can even add stands to this with an option to space them 12, 13.5 or 15 inches apart. The road tires should be 20mm. You’ll also benefit from a limited warranty. All defects are covered within the first year; after that you’re on your own! You can put this stand on cement or carpet but it is best to have a flat, even surface. 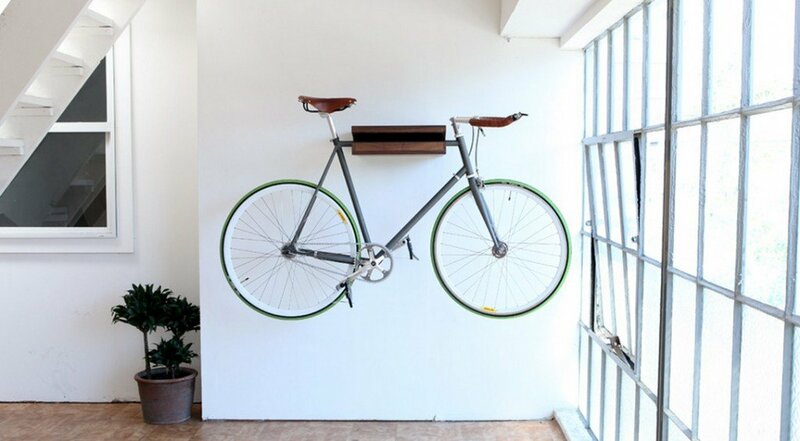 It is also possible to make a small modification yourself and mount the bike stand on the wall. Your bike will then be backed on its end; taking up even less space in your home. This innovative design deserves to be on this list, take a look online and you’ll find very few, if any, negative comments regarding it. This is another floor based bike stand. 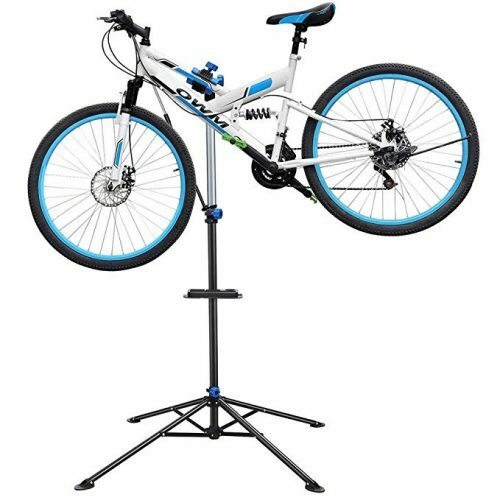 This style of bike support stand is exceptionally popular as they are generally very easy to use and portable; allowing you to take it with you to the office or even a friend’s house. In fact, the second offering from Bikehand on this list is a very simplistic and stylish looking bike stand. You may even be puzzled regarding how it is supposed to effectively work. Fortunately, it does work and works very well; especially considering it is one of the best budget options on the list! The stand looks a little like a trendy bookend. It sits at 39cm tall, 19cm wide and 29cm long. It is all silver except for the pronged part which is plastic coated and measures 18cm by itself. The Bikehand rear hub bike stand weighs just 4.9 pounds; it is effectively held in place by the eight of your bike although you could secure it to your floor if necessary. It looks stylish and the design is rigid; in fact, it is safe to say that this is probably the fasted way to park your bike. It is well made with a one year warranty against defects and should accommodate any type of bike; even those with disc brakes or custom frames. It is worth noting that tires at 700c, 29 inches or higher will be a tight squeeze. There is a larger rack which you may prefer to get; although it works on exactly the same principle and style. This bike stand is designed to accommodate almost any bike and you can slide the front or back wheel into the stand. In theory, this is great but several users have reported issues with sliding the back wheel in on a disc braked bike. You may need to check it fits if you must secure it with the back wheel and have this type of bag. The stand has four rubber pads on the underside of it. This helps it to grip on your floor and prevent it from damaging any flooring you place it on. Of course, it is advisable to use this bike stand on a level floor or you’ll be tempting fate for it to fall over. To actually use the stand you simply roll your wheel onto the stand next to the pronged section. The prongs should slot onto your rear hub; preventing the bike from moving or toppling. The final contender for best bike stand is the one with the longest title. But that doesn’t make it an unworthy option! The Delta Cycle Michelangelo Canaletto is actually a well designed and versatile bike stand. It follows the same vein as the first stand on this list but with a very different style. In fact, you could mistake it for a coat or hat stand! The stand consists of two poles which merge in an almost flat top and have a brace near the bottom. The lowest part of the bike stand has bars which extend away from the main poles and create a gradually widening gap as they angle towards the floor. This helps to keep the weight of the bikes on the rack and the wall; not the floor or in front of the rack. The main poles slot against a wall to ensure the bike stand is secure. The entire rack leans on your wall; it doesn’t need to be screwed into place although it is possible to modify the frame and do this if necessary. There are two hooks on each pole; they are designed to curve around the main poles; preventing them from moving once you have positioned them where you want them. They are very easy to move up and down and even set the angle you need them to be at. These hooks are covered in rubber to ensure they do not damage your bike as you lift it on and off the bike stand. These also grip the bike to ensure it doesn’t slide while sitting in the cradle. This allows you to accommodate virtually any bike; even a woman’s bike or a child’s. The arms can literally be set to the bike. The ideal position is to have the hooks under the top crossbar of your bike but there are several other options depending on the style of your bike. The rack itself is made from steel with a silver powder coated finish. This ensures it looks good in your home and provides some protection for your bikes. It measures 83 inches tall, 19.75 inches wide and 16 inches deep. You should be able to safely add two bikes with a combined weight of 80 pounds. The rack itself weighs just 4 ounces! It does require a small amount of assembly but everything you need is included in the bag and the process of putting it together is actually surprisingly easy! It is important to think about how often you’ll use your stand and where you are most likely to use it; before you buy one. Are you looking to store 1 bike, 2 or more? This is an important question to ask yourself before you decide which bike stand is right for you. While all of these bike stands are designed for a specific number of bikes it is possible to have more than one stand. However, you’ll need to consider the space this will occupy and how it will look in your home. For example, if you have a big garage or shed then having four bikes individually stored on the Bikehand hub mount bike stand. This will mean the four bikes will sit next to each other, taking a considerable amount of space but they will all be safe. If you have less space then you may need to consider using 2 of the gravity stands; these lift the bikes minimizing the floor space they occupy. Of course, you will be taking up some fairly large wall space to accommodate this; you’ll need to make sure the other residents of your home (if there are any) are happy with this. It is important to consider your budget before you buy. Individually the majority of these bike stands are surprisingly affordable. However, if you do need to buy 2 or more then the amount can quickly add up. Make sure you can comfortably afford your chosen bike stand before you commit to purchasing it. No matter how important it is you can’t see this as an essential; waiting a few weeks to get the necessary funds together is acceptable! 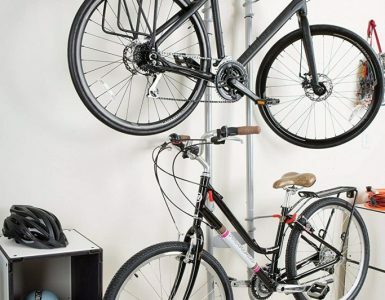 As well as considering which bike stand or stands you need to accommodate the number of bikes you have, it is important to think about the space you have available. Floor bike stands are very easy and portable, but they don’t save you any real space. There purpose is to secure the bikes; preventing them from being damaged. If space is at a premium you’ll need to go for the gravity style bike stands. This allows you to make the most of the space you have. How Does The Bike Secure To It? It is worth taking a moment to consider how your bike secures to the bike stand. Is the stand likely to cause damage to your frame or are you going to struggle to lift your bike onto the hooks provided? The right choice of bike stand for you will depend on the answer you have given to this question! 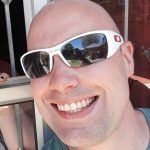 The bike stands listed in this guide are all made by reputable suppliers. However, if you choose to use an alternative supplier you should check out the reputation of the manufacturer. Asking your cycling friends and taking a look on social media is one of the easiest ways to achieve this. You can quickly get a feel for the overall satisfaction of the customer and even make yourself aware of common issues. 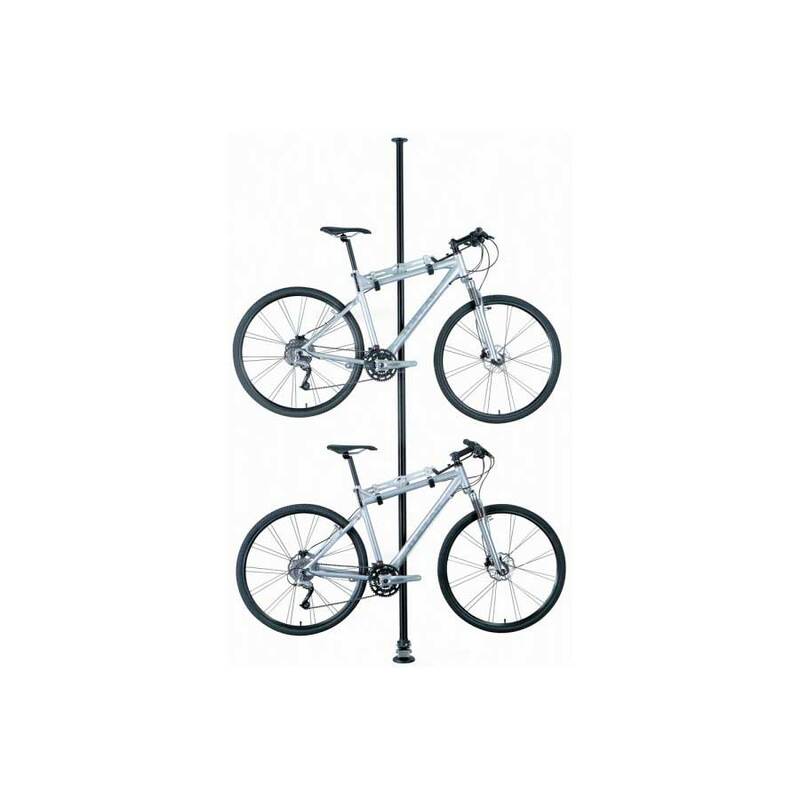 If these are not likely to be a problem for you then it could be the right bike stand for you. In general, a bike stand is intended to be used at home. This means your bike is already protected by the locks and other security at your home. However, if you have any doubts regarding this or your bike is of particularly high value you may want to consider what security your bike stand could offer. 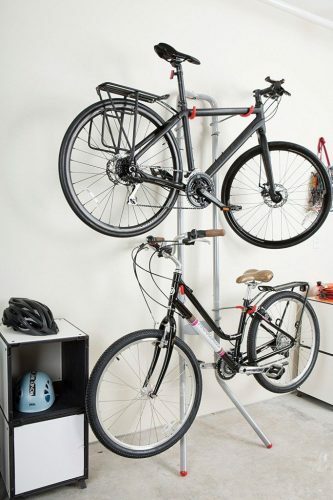 It is possible to attach a freestanding bike stand to the floor or the walls. This will slow down a thief. In addition, you may be able to add a lock around the stand and the bike. If you are unfortunate enough to have a break in this could make the difference between losing your bike and not. Of course, the better your security the longer it will take you to put on and take off your bike from its stand. This is worth considering if you use your bike a lot. If your bike is often used for your commute or simply for fun then you should not just consider which the most attractive budget friendly option is. You also need to look at how easy it is to get your bike in and out of the house or workshop. You don’t need to complicate the time it takes you to get out on your bike. Whether you’re an experienced bike mechanic or just hoping to do some more of the maintenance yourself, a bike repair stand can make your life much easier. The design of this stand is actually very simple. It has a central pole and just two legs. These come out in a ‘V’ shape from the central pole and are braced to ensure the bike stand doesn’t collapse while being used. The pole itself is aluminum alloy; making it very strong but keeping the stand light. In fact, it weighs just less than 10 pounds. One of the best things about this design is that the legs can be easily folded up and the bike stand carried with you. That’s great for storage or if you need to sort your bike out at a friend’s house. The clamp that secures your bike in position operates on a 360° basis. This is an unusual but very efficient and helpful design. The rotation of the clamp makes it possible for you to clamp your bike by the top bar, seat post or any other part of the frame. No tools are needed to tighten the clamp which has an oversized handle. It is well padded to ensure no damage can be caused to your bike while you work on it. Having said that it is recommended that anyone with a carbon bike clamps their bike with the seat post to ensure no damage can be caused. You’ll also be pleased to note that the stand adjusts in height; allowing you to find the height that works best for the operation you have in hand. The height is sufficient to fully rotate the pedals while you are working on the bike. This can be accomplished by twisting the lever and sliding the pole upwards; it is even possible to do this while the bike is clamped in position. A really handy feature is the magnetic tool plate which attaches to the main pole; you can select where to put it and then attach your most important tools to it; having them right where you need them when you need them. This bike stand will accept tubes between 1 inch and 2.4 inches in diameter. You can adjust the height from as low as 39” to as high as 59 inches! The clamp bolts onto the stand and this is pretty much the only assembly required; making it very easy to get started with this bike repair stand. This stand is surprisingly stable despite only having feet on one side. Of course, the lightweight nature makes it suitable for the home mechanic; not someone who spends a lot of time working on bikes. This stand also uses the single pole design but it has four legs making it easier to keep balanced even when the bike is mounted high. You can decide how far out to have the base legs via a simple adjustment knob at the base of the stand. They should all move in and out evenly to help spread the load of the bike. If you want to it is very easy to fold these legs back up into the stand, allowing you to move it around your workshop or even lend it to a friend! This bike stand is designed to accommodate bikes with tubes of between 1 inch and 1.6 inches in diameter. The height can be adjusted from 42.5 inches right up to 74.8 inches; ensuring you can work at the right level no matter what part of the bike you’re wanting to work on. With the stand, you’ll get a tool tray that clamps onto the main pole. This measures 9.6 inches by 4.9 inches. Your bike is clamped into place with a 360° clamp at the top of this stand. This allows you to fasten it to any part of your bike; providing the tube fits in its clamp. There is also a secondary bar that attaches to the frame near the front of the bike. This is mounted on the middle of the stand and helps prevent it from moving or twisting while you are working on it. This bar is actually rubber to ensure it can accommodate any size bike and still hold it rigid. The stand is designed to hold one bike up to a maximum weight of 66 pounds. It is very unlikely to tip or wobble providing you place it on a level floor. You don’t need to fasten it to the floor. The bike stand is made from standard steel and coated in durable plastic. This should not be affected by heat or cold. This plastic is what protects your bike from harm while it is clamped in position. It is worth noting that the pedals can be turned while the bike is on the stand; allowing you to do all the necessary work and check that it functions properly. There is a small amount of assembly to do when you first get this bike stand but it should be possible to do this in just 5 minutes, comprehensive instructions are included if necessary. Although very similar to the Yaheetech pro bike repair stand this is a different product altogether. In fact, it is a much heavier duty stand as it is made from iron coated in plastic rather than the steel construction used in the previous bike stand. The stand has the same basic structure, a single pole with four legs. However, the legs on these are longer and set higher on the stand. This allows them to create a larger and potentially more stable base. Of course, you still need to be working on a level floor to get the right results. Instead of clamping at the top of the main pole as the previous 2 have done; this offering from MV Power has a telescopic arm at the top of the main pole. At the end of the horizontal pole is another 360° clamp. Obviously, this is to allow you to attach the clamp to any piece of your bike you like; providing it leaves enough access to the bit you’re working on. The extending arm can be adjusted to change the angle of the bike as well as the distance it is away from the main pole. This can make it much easier to get to all the bits you need to. You’ll also appreciate the rubber lining on the clamps which ensure the frame of your bike is not damaged whilst you’re working on it. The stand is 45.3 inches tall but can be extended to reach 66.9 inches. Its clamp can accommodate frame tubes of between 1.57” and 2.95 inches; making it suitable for almost any bike on the market. The design is sturdy and well made; you are highly unlikely to have any issues regarding your bike remaining safely on the stand; even when you’re working hard on it. It weighs a respectable 12.2 pounds and can handle bikes up to 50 pounds in weight. There is also a handy tool tray which measures 12 inches by 6.9 inches. It clamps onto the main pole and will prove to be extremely useful! This is a nice feature and adds a splash of color to an otherwise mundane piece of equipment. The tool tray is bright red, as is the jaws on the clamp. You should be aware that the minimum tube diameter is 1.57 inches; this means that most seat posts are not big enough to act as a clamping point. It is also important to secure your bike at the center of its point of gravity. Leaving it off center can make the stand overbalance; not something you want when your pride and joy is on it! 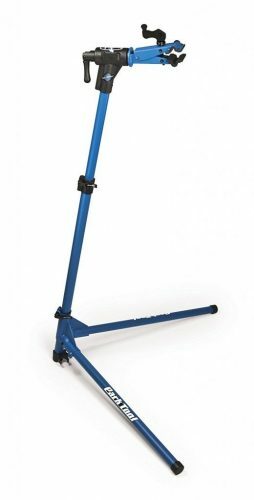 The Park PCS-10 is another bike repair stand that has just two legs; both extend in front of the stand creating a ‘V’ base. Despite first appearances, this is a remarkably stable option. Your bike will sit comfortably on the stand while you’re working on it without toppling. The fact that the center yolk is reinforced helps to make this stand so stable. The stand has one central pole with a short bar extending from the top and a cam-type clamp. This will allow you to clamp any tube between 7/8 inch and 3 inches. Although there is only one clamp this is enough to hold your bike securely. Generally, it is advisable to use the top bar of your bike but it is possible to secure it anywhere as the clamp rotates 360°. The jaws are made of replaceable plastic to ensure they will not damage your bike; they can also be replaced as and when needed. A great feature about the rotating clamp is that you can actually use it to swing your bike into an unusual position; allowing you perfect access to every part of your bike. Simply wind the handle to loosen the clamp and then fasten it around your bike, tighten as much as you need and then adjust the height of the stand using the knob in the middle of the main bar. The stand can be adjusted from 39 inches to 57 inches. The Park PCS-10 can be folded away when not in use, it becomes just 41 inches long. When in use the stand is 59.1 inches by 23.6 inches by 23.6 inches; it weighs approximately 25 pounds. You can even use this as just a bike stand for storing your bike! Perhaps more impressive is the fact that this stand is rated to handle 100 pounds; that’s a heavy bike! The reason the weight rating is so high is that you can put your electric bike on the stand if you need to; although it is still advisable to remove the battery first. It’s worth noting that this bike stand requires a little more assembly than the others on this list. However, it is worth investing in; the stand is steel coated with plastic and extremely durable; you are unlikely to ever need to replace it! Even better is the fact that all consumers who have reported an issue with any part of the stand when delivered have quickly had the problem resolved. The support from the customer service team is excellent. This is another that features the same design style, a single pole with four sturdy legs that slide in and out according to what you need. The legs are adjusted using a twist knob on the lower part of the pole. No tool is needed to do this part. It is important to be aware that some assembly is required when you first get the stand but it should only take a matter of minutes. As well as a good instruction manual there is a one year warranty to give you peace of mind. The stand is designed to be heavy duty and has been created from steel, aluminum, and plastic. It can handle bikes as heavy as 66 pounds and offers a stable working space. The clamp which holds your bike in place will handle tubes between 1 inch to 2.5 inches. At the top of the main post is a short bar with a 360° clamp on the end of it. This is to ensure you can attach almost any bike to the bike stand with the minimal of fuss. The clamp is easily tightened or loosened with the oversize knob at the top. It also has blue plastic jaws to help protect your bike. The stand can increase in height, going from 41 inches to 75 inches. IT may not be the highest on this list but it is perfectly good enough for all occasions. You’ll also find a useful tool tray which mounts on the center pole and can be moved to the appropriate position. This will make sure you have the tools you need to hand when you need them. It is also a good place to put the nuts and bolts when you remove them from the bikes. This Flexzion bike stand can be easily folded to allow you to take it with you and weighs just 12.57 pounds. In fact, folded it is only 35 inches by 5 inches by 12.57 inches. It is also possible to mount this bike stand to the floor. This is not to improve stability but is a good idea if you are using it a lot and want to be able to easily access it or leave your bike on the stand. The feet are pre-drilled to make it possible. Again, you can adjust the height while the bike is on the stand and turn the pedals fully to ensure everything is still running smoothly. All the bike repair stands on this list can do this and it is an important feature. Taking the bike off just to check it is time-consuming and frustrating. 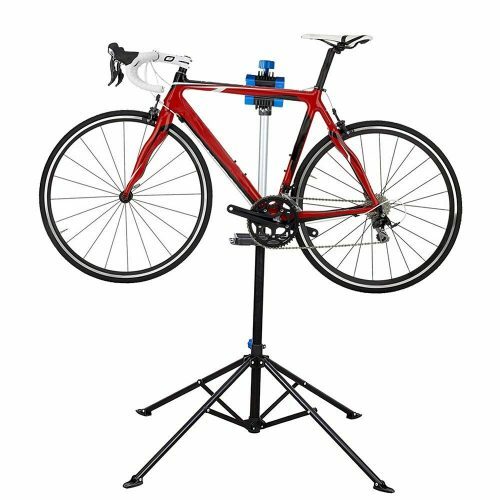 If you think it is about time you got yourself a bike repair stand then you need to consider the options already discussed in the previous section on how to choose a bike storage stand. Is It Portable Or Permanent? Most of the bike stands on this list can be folded up and carried to your friend’s house or put into a storage space. You need to decide whether the ability to do this is important to you. 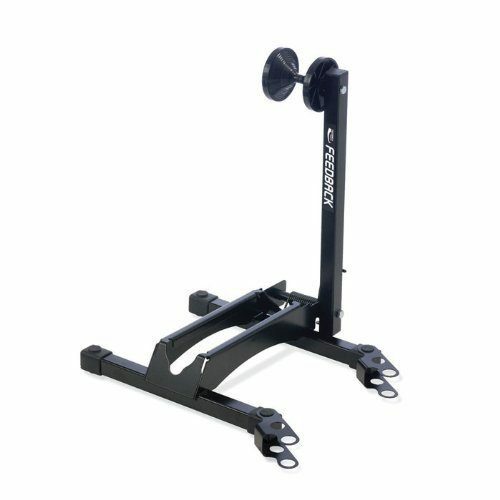 Screwing your stand to the floor should not make any difference to its stability but it does give you more confidence and allows you to leave your bike on the stand without risking it being knocked off. This does mean that you can only work on your bike with the stand at home, but this is not necessarily a bad thing! Does It Work On An Uneven Surface? You should also consider the floor space you have available and whether the bike stand can operate safely and effectively if the floor is uneven. There are some bike stands which are purposely designed to sit on uneven floors by having individually adjustable legs. If your floor is uneven and you can’t sort it out or create a temporary repair then you’ll need to select a different stand to the ones on this list. Can You Adjust the Height? All the bike repair stands on this list can be adjusted in height. However, you need to consider one step further than this. How tall are you and what is the best working height for you? The higher the bike is off the ground the more likely it is that the stand will become unstable. But, it is much easier working at eye level than spending all day bent over. Consider the amount of work you do on your bike and how high the stand should be able to go; before you commit to purchasing a particular stand. The best bike stand for you will depend on your needs. But, if you are looking for a bike storage stand or a bike repair stand then you could do a lot worse than the selection provided here. Check them out, talk to your friends and then treat yourself to the right one; you’ll be glad you did! I love the outdoors and I'm fortunate enough to be able to spend most of my free time exploring it with my mountain-bike. In my spare time I write reviews and guides for bike racks. 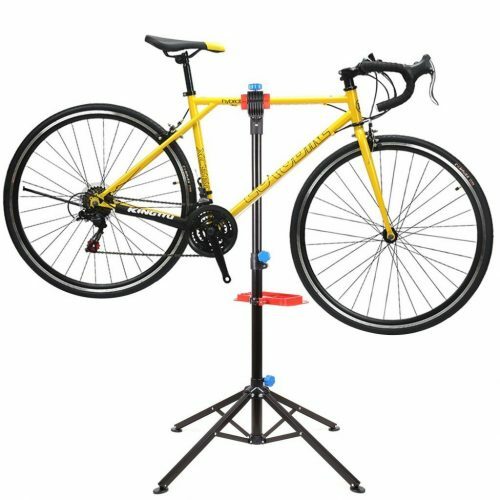 The Topeak Bike Storage Stand includes two bike mounts with an added capacity of up to four bike mounts and is one of the best space saving bike storage stands available.